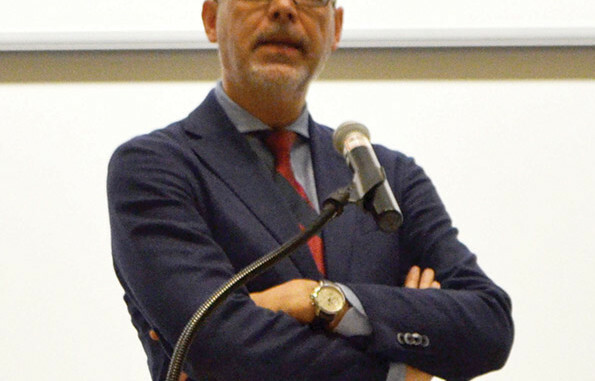 Last Thursday night, distinguished historian, author and scholar Fredrik Logevall spoke in front of history students, community members and faculty on a brief comparison of the events leading up to U.S. involvement in the Vietnam War and then more recent action taken in Iraq and Afghanistan. Logevall is a writer and educator of the Vietnam War legacy; in fact, he is the winner of the 2013 Pulitzer Prize in History for his most recent work “Embers of War: The Fall of an Empire and the Making of America’s Vietnam,” which also won the 2013 Francis Parkman Prize from the Society of American Historians. Logevall, an expert in U.S. foreign relations and 20th century international history, holds a PhD in history from Yale University, and is now the Laurence D. Belfer Professor of International Affairs at Harvard Kennedy School and a professor of history in the Harvard Faculty of Arts and Sciences. In short, when posed with the question how history repeats itself Logevall states, it doesn’t. He addressed the roles of politics, careerism and ‘American credibility’ on the overall decision for the United States’ involvement in foreign military affairs, in particular those decisions made in and prior to 1955 Vietnam War. JFK, Johnson and Nixon’s presidential role in U.S. involvement of the war was indeed discussed; in particular, Logevall says that after years as a historian and scholar, he has come to an exceedingly troubling conclusion: not one of those three men really believed in the war, each one of them doubted its prospects and miscalculated the impact of the war of the United States. Logevall expressed his understanding that we view history in a contextual manner. Fifty years ago, the natural orientation of a person’s mindset was in the past. In the present, as the people have progressed as a nation and as intellectual individuals there is a new ‘looking toward the future’ ideal as realization of some broken features and necessary changes come to light.